Posted on March 9, 2013 by Lena K.
Prism by HIGASHIYAMA Shou is a yuri manga with a total of 2 volumes thus far. Currently, the releases have been halted, which was caused by the unauthorized usage of specific reference pictures of the author himself. Read more on that topic by clicking here. Megu, a regular high school girl, struggles to get over her first love, Hikaru, a boy that she met years ago and spent only one single day with, yet the memory of this boy stays captured in her heart for years. Now that some time has passed, Megu is finally beginning to forget about Hikaru, freeing her heart from the feelings for a boy that she thinks she’ll probably never meet again. But life becomes more difficult, because just when she decides to not chase after this memory any longer, she encounters Hikaru, a pretty girl that seems to be very familiar. As you can see, the main idea behind the plot is pretty simple, yet very promising and new. The art is simple, yet very lovely. The artist didn’t really go into detail with the background very much, which makes the characters stand out more. What caught my eye in this manga is the depiction of hard to draw positions and unique angles from which we get to see the characters. I’m not that good at explaining, which is why I posted an example of what I mean below. One of the things that I loved most is the fact that this story, and especially the presented relationship, seem so realistic. The author really did a great job of showing the natural development of first love, to the point in which sexual actions between the two main characters seem only natural. While I enjoyed the story and its development quite a bit, I think it’s worth mentioning that the two main characters, Hikaru and Megu, especially made this manga so enjoyable. They’re cute together, both have unique and different personalities, and all in all match each other very well. This entry was posted in Adult, Manga, Manga Review, Yuri and tagged Prism by Lena K.. Bookmark the permalink. I was excited with Prism from the very beginning. And in my opinion, it was getting better in the last chapters released, with some realistic issues that lesbian girls have to face being subtly added. I think that Prism could have been a relevant manga for the yuri genre and also who is not necessarily a fan but likes romance could easily enjoy. But unfortunately, the author is a lazy artist and we are orphans of this work. I think while Prism was still on-going it was one of the most popular if not the most popular yuri manga out there. There probably isn't going to be a next chapter. nooooooooooooooooooooo!!!!!!!!!!!!!!!!!!!!!!!!!!!!!! 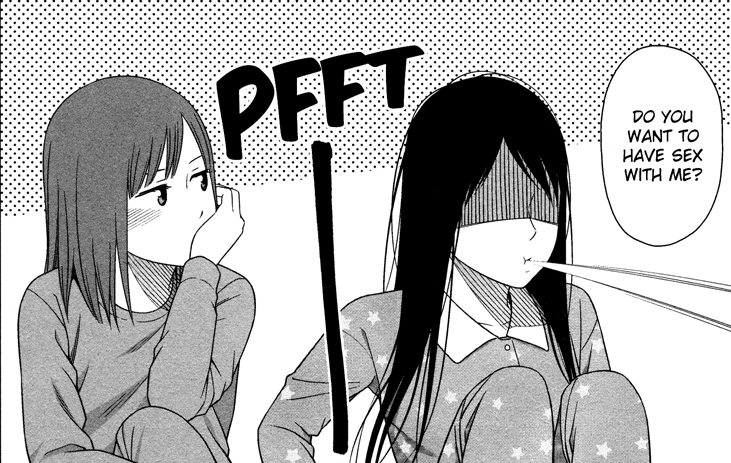 i really wnt prism to continue its such a good yuri manga. i just really hope theres a chance that it can continue. but if there is any info on if its gonna continue will you keep us posted??? Try Citrus by Saburouta, Gakuen Police and The Secret Recipe by Milk Morinaga and also Notes from the Garden of Lilies. They are not exactly like Prism, but ones that I consider to be very good and at least similar to Prism in one way or another. Do try Sasameki Koto, Sweet Blue Flowers and The Feelings We All Must Endure for some good heart wrenching yuri. I'm still hoping for Prism. Knowing Amano Shuninta's other works, it's very likely that “The Feelings we all must endure” will turn out just the way you want it to. I stumbled upon this manga by total accident a few days ago and I absolutely loved it. prism is the eye opener for me to. i love this kind of genre/style very much..im (too) lazy to search the manga with the same vibe as prism..
Something with the same vibe is pretty hard to find. I don't know whether I should just recommend you some other titles that I simply find equally great, but in any case, check out my Top 10 favorite Yuri Manga list. thanks for your recommendation list. i try the top 3..girlfriends is quite nice but the relationship development is drag and im not the one who have enough patient..haha…Also…girlfriends b/ground was so crowded…thehehe..as you say,the simple background in prism really made 2 main lead shine..that is why (i think) i can straight forward focus to the character feeling and emotion engagement..
i read citrus also…it is indeed nice but too angst for my taste..instead of feeling good, i feeling depressed when will the other lead truely show the same affection as another one..by the way its all about personal taste..i hope you r not offend by any means..
i read another piece of manga from prism mangaka..its “stretching” absolutely i like how she create those easy feeling vibe between the lead..there is no yuri or love engagement yet (but i beleive or maybe hoping) it was yet to come. the thing we really need is more sophisticated yuri manga..im really craving for that you know..
oppss..forget to say..nice knowing you lena!! You're just telling me your opinion, and I think you're even right when it comes to Citrus. It really needs some more carefree love, instead of all the angst and drama that is going on. I know I'm pretty late to this, but I read this only a few months back. Prism is the first yuri manga I've read and by far my favourite. Actually, despite lasting pretty short, maybe it's my…favourite manga? I loved it's art style, I didn't really mind the lack of backgrounds. Actually, I don't think I noticed it at all when first reading, because the characters not looking typically big cutsey eyed was what took me in. They looked like actual girl's compared to the usual Japanese style. And I just loved the wild flowing hair. Then there's the story. Everything about it felt so…real. The characters, their interactions, the dilemma's, all of it felt like something that might as well have happened from our world, and Hikaru and Megumi were both characters I could relate to on a personal level. They're 15? I'm 15. Hikaru had a crush on her best friend? So did I…which lasted for like, just over a year 😦 I could really identify with Hikaru's pain. They went out? Just over seven months going, so are we! I never expected it when finally telling her I like girls (without telling her I'm into her) only to be asked if I liked her *_* and before I could respond (I don't think I could have anyway) she said she wondered about it and that she liked me!! Reading Prism really brought that memory out *squees*, it was like I was reading a relationship that had actually happened to two teens. The only problem is (besides ending too quickly), this manga was too good for me. I just can't get into any others. One I read was “Girlfriends”. I won't whine that it “took too long for them to be together”, since, you know. It's that Mari and Akko's interactions hardly felt genuine, and the dilemma's where too many. And I'm not talking about when Mari felt awkward around Akko because of her feelings, I liked that part. I also couldn't believe how much they hung out at the shops and all. Maybe some girls do? Maybe some are like that in Japan?? I don't think so, then again, I don't know anyone like that, but I just couldn't get really into it until towards the end. Well, you've already read my answer, so I think it's all good. Such a shame this was halted as i was really enjoying the relationship between Megumi and Hikaru, I loved that the boy crush that Megumi had was with Hikaru when she was a little tomboy. That was cute. For the 6 or so chapters, I total bought into them two been a couple and that it wasn’t just a phase. I liked the teacher (who was Bi) character, who helped them out but I can see her character been seen as a bit pervy. Also liked that they came across homophobia, which a lot of Yuri manga’s i find don’t touch that much. As I said such a shame it was halted, as Prism had the potential of been up there with the very best Yuri Manga’s. I think you probably needed over time to add a bit of drama to their relationship, put a few obstacles in their way. But at least with the ending we got wrapped it up somewhat nicely, the fact they were in a relationship and were in love. I’m happy we weren’t left wondering if they got together. Anyway I give this a 8/10, sadly wasted potential of a classic Yuri here.